Painting Wharfedale in any weather is wonderful – it is a Dale of so many contours and vistas, so many favourite places. Having lived here most of my life I have watched it change through many annual seasons – and none is more mesmerising than SNOW! A wintery blanket changes everything: the light, the focal points, the colour. Snow covered contours seem completely different: snow textures the steep slopes of rocky vegetation, it bounces the light from deep drifts in moorland dips and on the fields, it dramatises the dark lines of stone walls. The valley dances with different light, shadows become more purply, snow drifts become blue, the sky is full of grey hues. A dazzling distraction. Soft pastels are brilliant at capturing this: they flow, blend, colours can be gloriously vivid or nudged into soft shadows; texture can be added, light augmented to a wintery gorgeousness. A new set of purples makes my fingers tingle! But first, there is a bit of hard work to be done. Making these lovely sticks of pure colour behave themselves requires a bit of prep work. Over the decades I have realised that successful landscape painting is not just knowing the land, enjoying it, walking in it, observing it…. but also taking time to lay some good ground work on my pastel surface before I start to paint it. (It is still called painting, even though the pastel pigments remain dry.) It might sound a little tedious (especially when you’re all revved up ready to paint! ), but I have 2 big rules: taking time to properly PREP MY SURFACE and carefully consider my COMPOSITION PLAN. To make the fabulous, vibrant colours of soft pastel stay on the surface of any paper, the surface needs to be gritty – the grit being ready to grip all those particles of pure colour! Any thick paper or card that has a slight texture can work and lots are available from the art material shops. I tend to prime my own card (I use artist mount board) with a readymade primer so that I can control it and layer it thickly where it will be required. But where will it be required? What shape does my card need to be? What size? Where will the horizon of my landscape be, where will rich under-colour be needed? The answer is all in my composition plan. A cheap pad of paper and a pencil is all that is needed – plus a bit of patience! 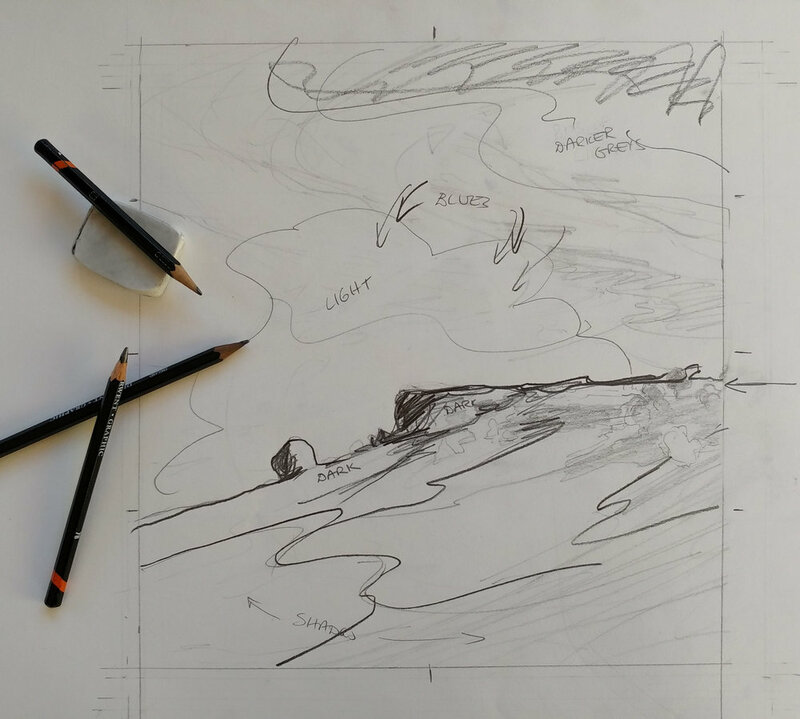 All my landscapes are carefully planned before I start: on my sketch pad I can erase mistakes easily, play with where a horizon might sit, what overall shape will suit the scene best, how the light is going to flow. My plans are not pictures in themselves, but MAPS… with notes and arrows and ideas and thoughts. It all might evolve a little as the painting gets underway, but starting with a composition ‘map’ I feel I’m halfway there already. I cut my card to the right size and shape and apply acrylic paint to get rid of the blank surface. When that is dry I brush on a generous coat of primer. I have a good idea of where I’m going as I pick up my soft pastel colours, and I can focus on the dazzling snow without distraction. And so I’m rather hoping for more snow this winter, I wonder what other Dales look fabulous with a winter coat? DO YOU KNOW YOUR WIDDALE FROM YOUR WALDENDALE?